Our flight was with Finnair and it was such a comfortable experience. Between watching movies and sleeping, we arrived in Bangkok fresh and ready for the start of the journey. Without even stepping outside of the airport we got into our next flight to Chiang Mai, with the company Thai Smile. In the plane, we could see the breathtaking scenery and experience that beautiful feeling of seeing something new for the first time. The heat was intense, especially coming from Finland and the Netherlands, but for me, heat wasn’t a problem, quite the opposite, I love warm weather! Next stop, was our hostel, Yolo Chic House. This budget hostel was quite charming and clean. There, we met up with our friend Anthony, changed clothes and started our first walk through town - we had no time to lose. No guide in our hands or advance planning, we just went looking for Chiang Mai fabulous temples and entered in all of them, at least the ones we passed through - safe to say there were more than a few! It was unbelievable how many temples there are, all the colours and forms, I was so amazed. In the centre, we stopped at a small Thai restaurant, just past Tha Phae Gate at the beginning of Rachadamnoen Road, and I ate one of the best green curry, ever! Even if it didn’t look fancy, it had the rich flavour of home-cooked food, tasty and satisfying. To go along with my curry I had a milkshake with banana and mango and it was beyond delicious. I think we paid about 2 euros per person and I could not be happier to have the first taste of real Thai food. Unfortunately, I have no photos of the food or the place, also I can’t seem to find it in google maps, what makes this “mysterious” place even more interesting. We continued our temple run on Rachadamnoen Road until late afternoon. At the end of the day, we decided to have dinner at the Riverside Bar and Restaurant, near our hostel. During the night we sat in the hostel lobby drinking beer and enjoying the warm night. The alarm on our first morning in Chiang Mai was the charming sound of children singing from a school nearby. We prepared for our next adventure and hop on an Uber to get to the start of a small hike leading to the Wat Phrathat Doi Suthep (the name of the trail is Wat Pha Lat Hike/ Monk’s Trail). On a side note, Uber was such a great tool for our transportation throughout the entire trip, it was reliable and cheap. The first temple we encountered on the way was the “Wat Sakithaka (Pha Lat)”. The landscape of the forest was beautiful and the path was quite easy, on the way there were some orange ropes to serve as guidance as well as some written signs. To get to the first temple area we took about 45 minutes. There, we found a beautiful waterfall and a range of temples and statues preserved deep down in the forest. After taking a break and embracing the quietness of the moment we continued until our next destination “Wat Phrathat Doi Suthep”. The second part of the way was a little bit more challenging. It requires plenty of water and a map with GPS to help find the way. Definitely, I don’t recommend taking a taxi though! It's a walk that's worth doing. The landscape of the forest changes along the way, and in some parts the roaring sound of the cicadas’ created a unique scenario. We knew that we had arrived to the correct place by the amount of tourist gathered there; and, after a long colourful stairway, we found the first golden and shiny views of one of Northern Thailand most revered temple. To go back, we took a songthaew taxi to the North Gate. This taxi is shared with several people and is, mainly, the only option once you are up there. The price is also affordable. For lunch, we had some noodles at a food stand near a school in the North Gate. In the afternoon, it was time for our cooking class at Zabb E Lee Thai Cooking School. They picked us up at our hotel and along with the other participants we started by visiting the local market. There, they showed us a variety of vegetables and herbs typical of Thai cuisine that are generally (and sadly) hard to find in our hometowns. Our guide was a young woman from Bangkok who had recently moved to Chiang Mai, she was super sweet and friendly. In the class, we were making various dishes, including 1 soup, 1 stir-fried plate, 1 starter and 1 main dish, plus a dessert for everyone. The class space was very well organised and had everything we needed. The amazing thing about this class, was the fact that they guided us throughout all the process, ensuring that in the end, we would cook/get a perfectly delicious dish while keeping us in charge of our own stand. The entire experience took around 5 hours and we ate all the 5 courses that we prepared for ourselves. It was so worth it! The food was delicious and, in the end, we even got one recipe book, all for about 21 euros per person (course, food and book)! At the end of the class, they called an Uber to take us back to the hostel. Day 3 started with a walk to Warorot Market and lunch on the third floor of the market building. The food was really delicious and cheap. On this day it rained for the first time, so after visiting the Market we decided to call an Uber to go to a different area of Chiang Mai, the Nimmanhemin district. There, we discovered super interesting streets full of nice cafes, where we stopped at “Ristr8to Speciality Coffee”. This place was known for its excellent coffee, it was full of students and had a relaxing and modern vibe. After a short walk around the neighbourhood, we found a good place for our first Thai Massage “Shanta Premium Massage”. It was extremely clean and pleasant and it was so fun to have this first experience there. After our massage, we found a place with excursions that finally persuaded us to book our trip to Doi Inthanon. The lady was really helpful in assisting us to find an excursion that fit our wishes and budget. We didn’t want any excursion that had elephant riding, but instead a bit of trekking with a visit to the waterfalls included. In another early morning, we were picked up for our excursion to Doi Inthanon, in the company of another small group of travellers and our wonderful guide, Ben. She was the sweetest woman, full of energy and good vibes; always with a smile on her face and fun facts to share. She probably did the same excursion every day, and yet made it feel so unique to us! This day was very rainy and foggy but we were ready to go! After a couple of hours on the road, we arrived to the first waterfall; it was such a beautiful scene, right in the middle of the forest. After that, we moved to the pick of the Doi Inthanon, the highest point in Thailand where we did a bit of a walk in a small part inside the forest. The waves of fog circling us created such a surreal and staggering environment. After this small walk we went back in the van and arrived to the main attraction area, where the most famous photos of this place are taken with beautiful gardens and the two adjacent pagodas (Naphamethinidon and Naphaphonphumisiri). These two pagodas were built to honour the 60th birthday anniversary of King Bhumibol Adulyadej in 1987, and the 60th birthday anniversary of Queen Sirikit in 1992, respectively. The temples were hidden beneath the fog, so we couldn’t even see the next person standing in front of us. It was a bit disappointing, but without any regrets, we moved on to the next stop. On the lower slopes of Doi Inthanon, we began our real excursion in the forest, with a guide from the Karen hill tribe village. Around the Ban Sop Had area, we saw the Wachirathan waterfalls, amazing rice fields and even poisonous snakes! At the end of the walk, we drank locally grown coffee and Ben explained that the last King had brought plants and seeds of coffee and flowers and offered to the community as a strategy to encourage them to grow it instead of opium. Lastly, we passed in the Karen hill tribe market and bought some dry mango fruit (my favourite!!). Returning to Chiang Mai, we moved to a new Hostel, “Nice Sleep Box”, right in front of the Night Bazaar. For dinner, we accepted the suggestion of a taxi driver to try the Saturday Night Market. With several stands and all kinds of products, from food to clothes, we ate some bbq fish, bought some handmade clothes and enjoyed the lively environment. Chiang Rai was our next destination. In the early morning, we went to the station to take the public bus. While waiting at the bus station, suddenly the national anthem started playing and all the people around us froze immediately. Life had stopped for a moment in such a respectful way, especially visible in a busy place like this one. While they would stand still, they would pay respects to Thailand’s national anthem, to their King and to the country. We learned later on that it can be heard every day at 8 am and again at 6 pm, coming from televisions and radios and loudspeakers all over the country. 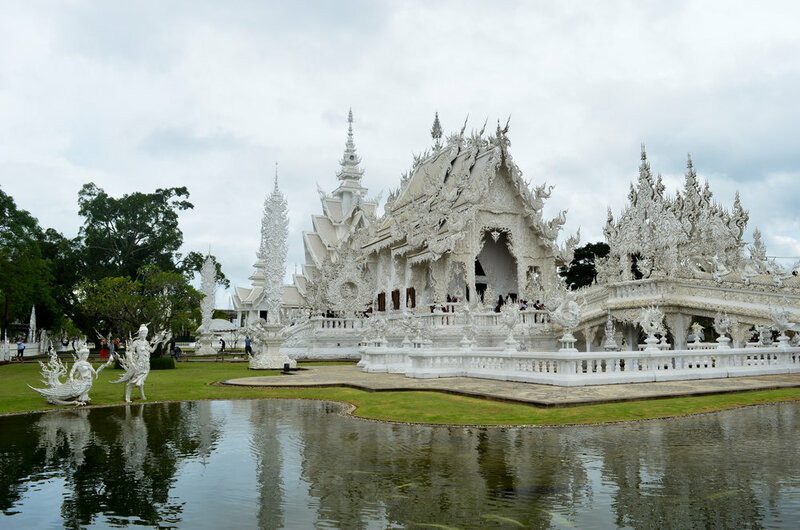 Our first stop was at Wat Rong Khun, the White Temple; owned by Chalermchai Kositpipat, an artist born in Chiang Rai. This temple feels like a contemporary art exhibit, disguised by an unconventional temple style, where everything feels dreamlike. Inside the temple, the main attraction are the murals that cover all the walls. With vibrant colours, the artist did a modern representation of good and evil, mixing religious Buddhist stories and western contemporary ones with figures like Batman, Spiderman and Harry Potter. This artist’s masterpiece is responsible for the large amounts of tourist who visit Chiang Rai, and this place in particular. The artist designed, constructed, and opened it to visitors in 1997 and he is still working to expand it. He has also a museum right in front where you can see more of his paintings and other artworks. The temple was great but definitely overcrowded. Next stop was the centre of Chiang Rai. Since it was lunch time we moved to one place recommended in Lonely Planet to eat a very typical Northern Dish, the Khao Soi. Pho Chai Restaurant was probably one of the highlights of our entire travel to Thailand, marked by delicious food and its authenticity. 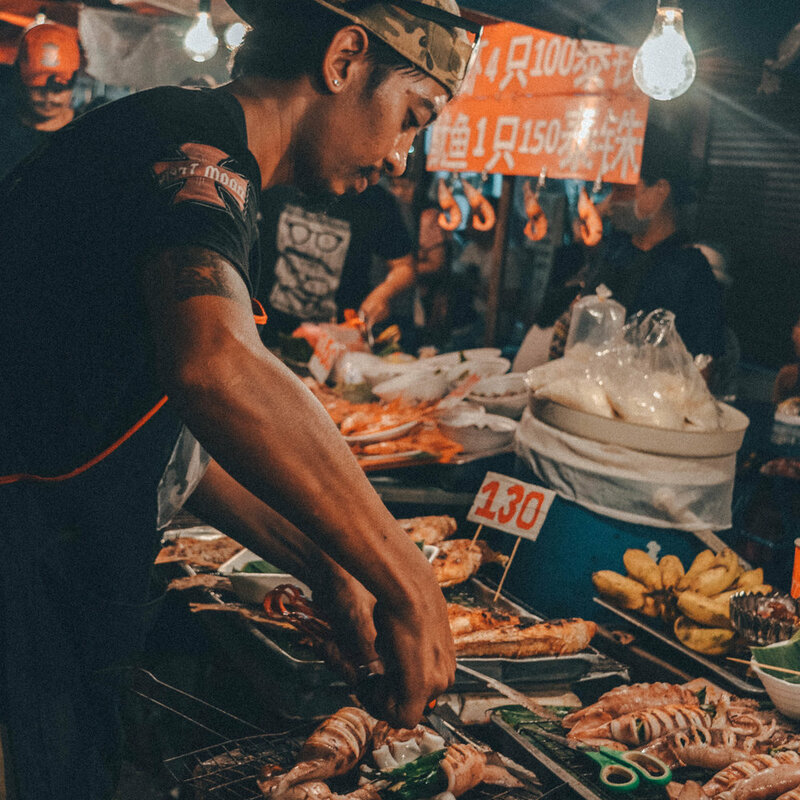 Best food in Thailand is definitely the northern food, so enjoy without regrets! After having the best meal of our life, we visited “Wat Phra Kaew”. Throughout the city, there was such contrast to the White Temple area - there were no tourists nearby! At this point, we kinda regret not having left more time for Chiang Rai. There was so much to see and it seemed such a unique place. As we did not have much time, we then went to Baan Dam Black House Museum. The Black House Museum was created by a local artist called Thawan Duchanee, who studied art in Bangkok and Amsterdam in the 60s. His work was very controversial at the time but then reached big fame and acceptance all over the country. It was partly his artist studio, house, meditation space and museum. We got lost in its gardens for more than we were supposed to and, when we decided to go back, we noticed that there were no taxis or Uber available in that area. All transports parked outside the museum were private operators. Since we had to rush to catch our bus to Chiang Mai we decided to start to walk to the highway hoping to find a taxi. Suddenly and luckily we saw a group taxi, and we jumped in. When we arrived at the station we found out that our bus was gone. To save our day, there was a very nice and crazy Tuk Tuk driver that made his mission to help us out! It started the most insane tuk tuk ride of our lives and after running between cars, bikes, people and more, we finally arrived to the next bus station where we could see and finally catch our bus! For the last day in Chiang Mai, we took it very easy and just woke up later than the usual, went for coffee again at Ristr8to and did a second massage at Shanta Premium Massage. We decided to come back to this neighbourhood since it was our favourite. We found a new spot for lunch, where the pork and the fried rice were delicious, as well as the papaya salad. The restaurant was called “Somtum Sola”. Since the food was good and also affordable, we decided to buy extra and take it for dinner. At the end of the afternoon, we took our luggage and moved to the Train Station to take a night train to Bangkok. It was a 13 hours long journey but I could never imagine that was going to be so pleasant. At a certain point on the journey, a staff member comes to make the bed, everything is so clean and comfortable. Is not modern or fancy but it was everything I could hope for! I read a bit of my book, enjoyed the landscape and then closed the curtains and went to sleep. Next Morning, we were just arriving in a new place for new adventures. Good morning Bangkok! !